Located in the Jackson Township on 3.5 acres surrounded by the beautiful backdrop of the pine barrens. 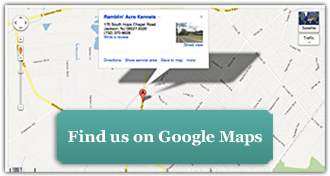 Ramblin' Acres is 20 minutes from Six Flags Great Adventure, and 15 minutes from major highways such as I-195 and the Garden State Parkway. 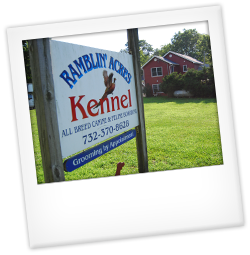 Here at Ramblin' Acres we specialize in personalized quality care for your four legged family members. 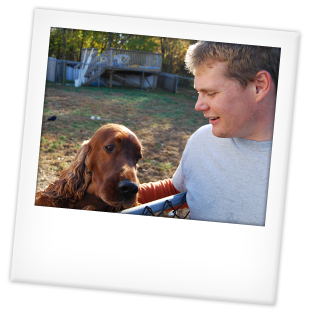 We understand that that they are a part of your family and want your pet to enjoy their stay with us. Not only have we cared for our communities pets for over 40 years, but we also breed and raise our own AKC Champion Irish Setters and Wolfhounds, as well as other owner's top show dogs from across the country. We treat every dog that comes to visit us with top-notch care whether it be your family house pet or someone's top champion show dog. Ramblin' Acres has been family owed and operated all through out our existence. Our care taker's residence is located just above where your dogs sleep, allowing for sound peace of mind for you and your dog. Unlike some kennels, even though he have closed our doors to the public we maintain constant supervision through out the day and night. We offer individual large indoor outdoor suites, that are fully covered on the outside and heated and air conditioned on the inside. Your dog will have their own exclusive suite separate from our other guests. 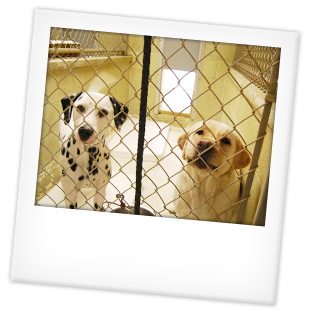 However, if you have multiple pets, our suites are large enough to accommodate double and triple occupancy. Along with our individual indoor/outdoor suites we have also have outdoor play areas that allow your pet to get out, play, and run. These are also individual areas and your dog will not be put with any other dogs, but can enjoy the companionship of other guests romping in a run next to them. For our feline friends we offer spacious cat condos. These 3x3 areas have enough room for multiple cats and comes with a perch they can jump up to and a separate individual litter area. Please feel free to drop in during our regular hours and see our facility. If coming in the evening or later afternoon call ahead. We sometimes step out for a moment to run errands in town if we are not expecting anyone for the afternoon. We get all sorts of guests here at Ramblin' Acres Pet Resort; cats & dogs... claws and paws. To accommodate all of our clients, we have expanded our climate-controlled kennel with spaceous, outdoor runs so your dogs can get all the shelter and exercise they need. Meet some of our recent residents.